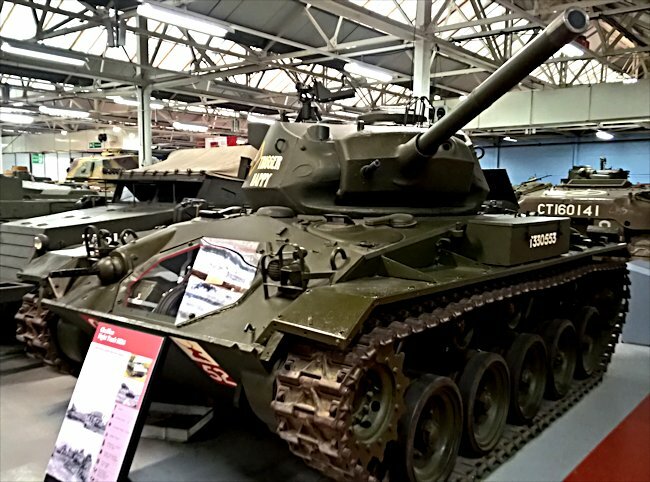 This preserved M24 Chaffee Light Tank can be found at the Tank Museum, Bovington, Dorset in Southern England. The M24 Chaffee American light tank was designed to replace the aging and obsolete M3 and M5 light tanks. 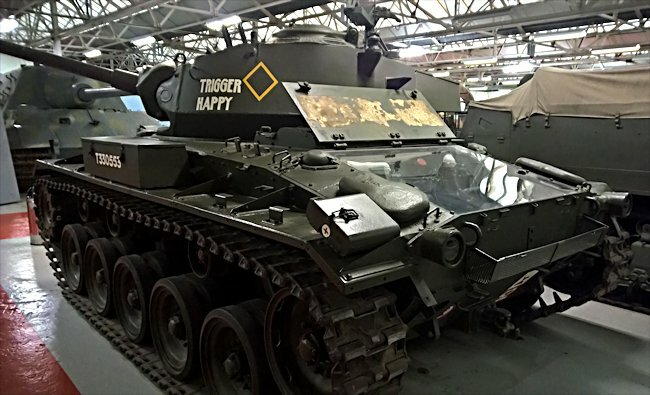 It entered service in 1944 as a reconnaissance tank. Its main gun was a vast improvement over the older light tanks. They only had an underwhelming 37 mm cannon. The Chaffee was fitted with a new lightweight 75 mm M6 L/40 gun that had been developed for the Airforce. There was storage for 48 75 mm rounds inside the tank. For extra protection at close quarters from enemy troops it was also armed with one powerful .50 cal Browning M2HB machine gun. It was fitted externally on the turret. Fitted to hull and in the turret were two additional machine guns that could be fired from inside the protective armour of the tank. These were .30-06 Browning M1919A4 machine guns. The designers had a problem. They needed to keep the weight of the tank down to below 20 tonnes so it could travel at high speed and perform the role as a scout tank. They wanted to give the tank crew as much protection as they could. They went for the option of using angled armour plating where ether they could. The armour thickness ranged from 38 - 15 mm but because it was angled the there was a greater chance that enemy shells would ricochet and the distance the shell needed to travel through the armour was increased before it penetrated the hull. 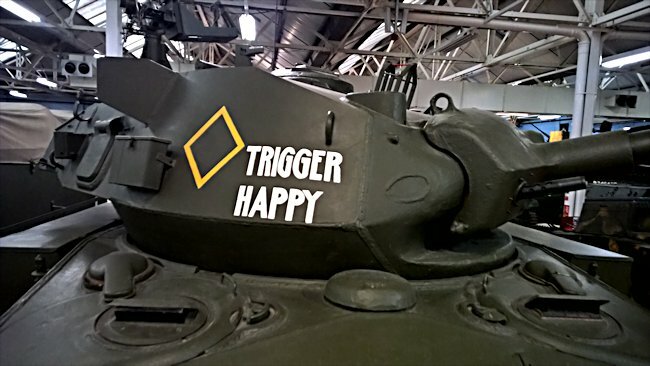 This tank was not designed to fight other medium and heavy tanks. Its low profile and small size helped it get near to enemy positions. Find out where they were. Radio back the information and scoot back to Allied lines and saftey as fast as it could go. They would also sneak up to a position where they could see the enemy and radio in air and artillery bombardment. if they were spotted and fired apon the tank had enough speed to get the crew out of trouble. On the road the M24 Chaffee had a top speed off 35 mph (56 km/h) and off road 25 mph (40 km/h). When production of the Chaffee finished over 4,000 had been built. This includes various variations of vehicles that used the same M24 chassis. It saw service in France November 1944, the Battle of the Bulge, the Battle for Germany, Korea, Vietnam, Algeria, and Pakistan. It was sold to many Armys around the world after WW2. Where can I find other preserved M24 Chaffee Light Tank?